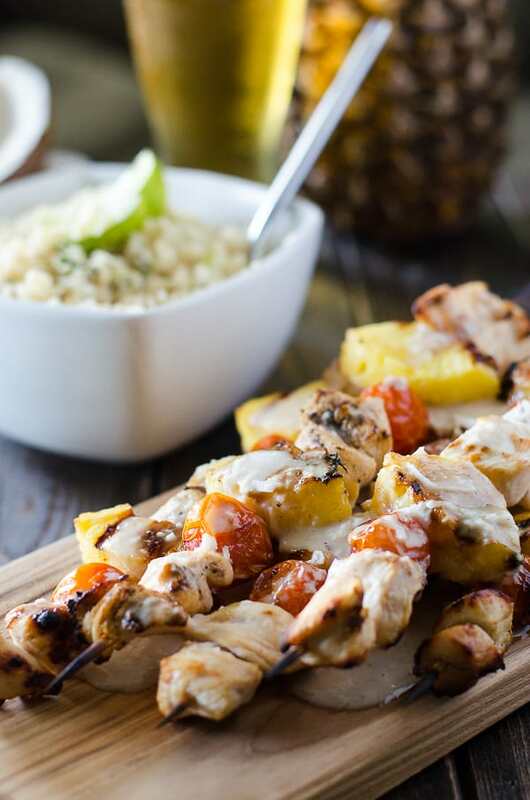 Fresh pineapple, cherry tomatoes, and coconut-marinated chicken take a classic cocktail to the grill and put it on your dinner table with these Pina Colada Chicken Skewers! Guys! Today is one of the best days of the year!!! Forget the fact that it’s back to work tomorrow. Or that we’re in the dead of summer sweating our butts off. You have to take a moment to kick back and relax with a frozen cocktail, today – cuz it’s National Pina Colada Day! 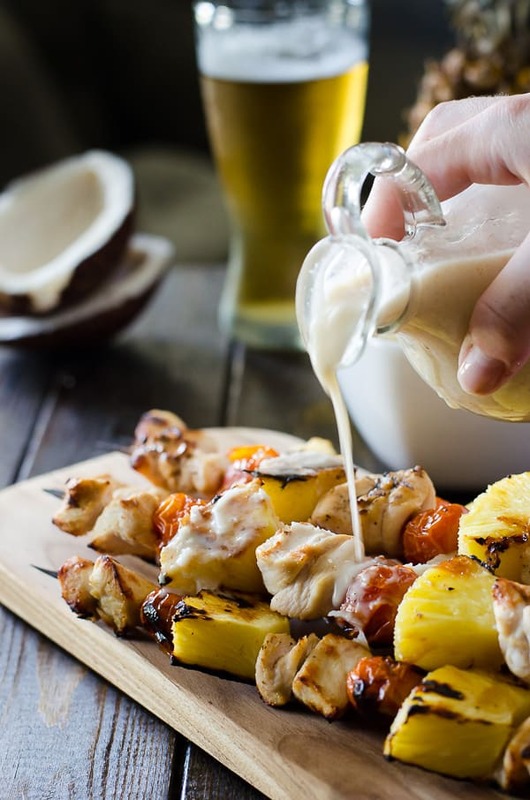 Of course, celebrating all the flavors of the pina colada is pretty easy even without a frosty drink in your hand, and us peeps at Sunday Supper have come to prove it! 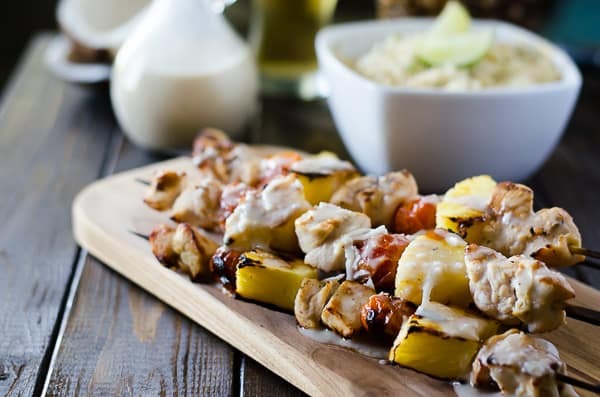 My contribution is a lovely little grillin’ ditty – Pina Colada Chicken Skewers. I am head over heels in love with everything coconut. Have been for as long as I can remember. I’m not sure when it started, but I can recall coconut pudding and one of those store-bought square coconut cakes in the fridge almost all the time growing up. When I reached the legal drinking age, I was super predictable when I went out with my friends: I would only order pina coladas. I wasn’t very adventurous when it came to libations, and I knew what I liked. 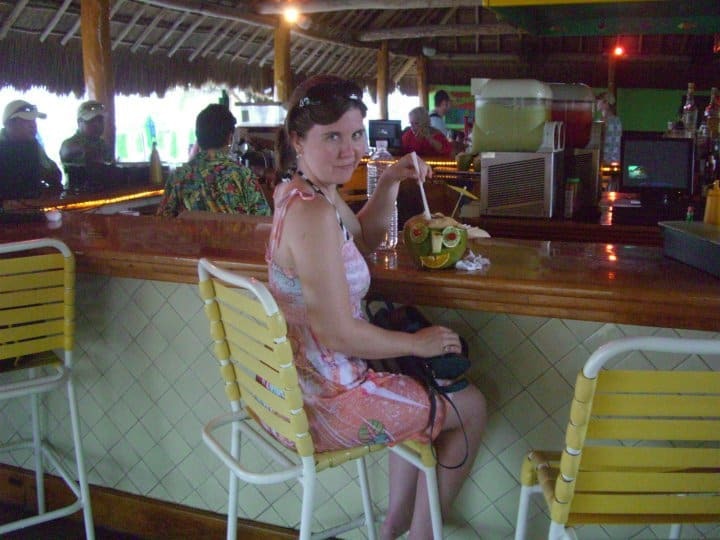 Those creamy, cold pineapple and coconut concoctions were the perfect blend of a little booze and a lot of fun. Mr. Crumby and I went on a cruise that stopped in Cozumel a few years ago, and all I wanted from that island was a pina colada served in a real coconut. It rained 3/4 of our day on the small Mexican island, and we had rented a scooter to ride around and explore on. We started out dry, riding counter-clockwise around the island, stopping at Paradise Beach (the first beach area on the east side) to wait out the squall. And sat there for three hours. You can imagine my impatience. Luckily, there was a cute little tiki bar there, well-covered and protected from the downpour. Even more lucky was that they served exactly what I came for. It was a real coconut! It had a face! THE FACE WAS MADE OF FRUIT. I could not contain my joy. I was squealing like a little kid in a room full of stuffed animals. Needless to say, those three hours was enjoyed, in spite of the nasty weather. My tastes have changed slightly since then, but I still order pina coladas sometimes (Bahama Breeze, I’m looking at you,) and I really like to spike them with some strawberry daiquiri for color. Hellooooooo Lava Flow. So, Erica, if the challenge this week was pina coladas…where’s your dessert? Chicken? What gives? I’ve been asked that twice this week by people at work. I’ve spoiled them all, and they expect sweets with every week that passes. I was planning on making a dessert, but it just seemed too obvious. I played around with a few ideas in my head and voilà! As a warning, these Pina Colada Chicken Skewers do not taste like a pina colada. 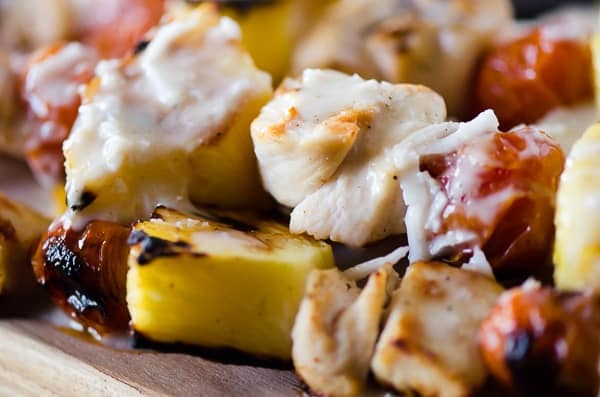 I mean, would you really want to down some cold, sweet chicken, skewered with soggy pineapple and tomatoes? Instead, what you have is delicious chicken thighs (or breasts if you’re a white meat-lover,) soaked in a coconut milk marinade overnight, fresh pineapple and cherry tomatoes (there’s always a cherry on top of a pina colada, no?) grilled to perfection. The marinade is repurposed as the coconut sauce that really makes these look the part of a pina colada, and it’s all served up on a bed of cilantro-lime cauliflower rice. You know, to complete the whole tropical feel. Yes folks, I’ve jumped on that bandwagon (and it will be on the blog soon!) But you know who else jumped on it with me? My rice-loving Dominican husband. These skewers are a perfect summer meal to enjoy with a real pina colada, if you’re so inclined. 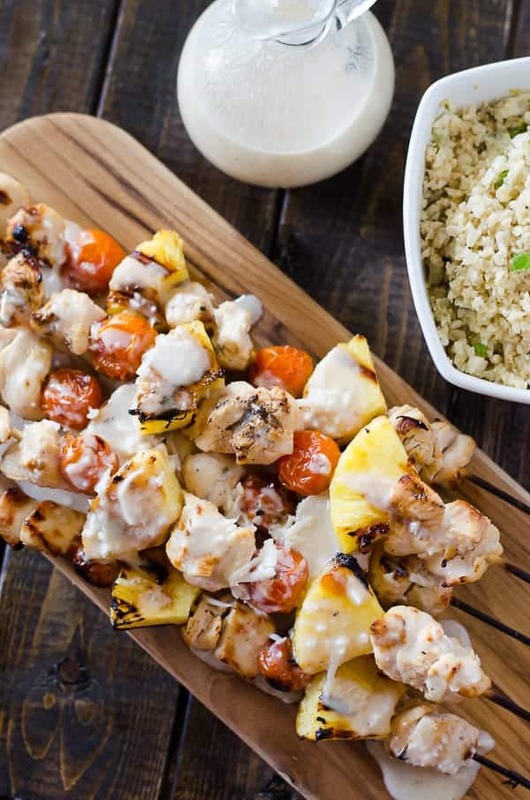 Fresh pineapple, cherry tomatoes, and coconut-marinated chicken take a classic cocktail to the grill and put it on dinner table with these Pina Colada Chicken Skewers! Spray or brush grill with olive oil; preheat grill on high. Line a baking sheet with parchment paper for less mess and keep near your work area. Pour contents of bag into a colander set over a bowl. 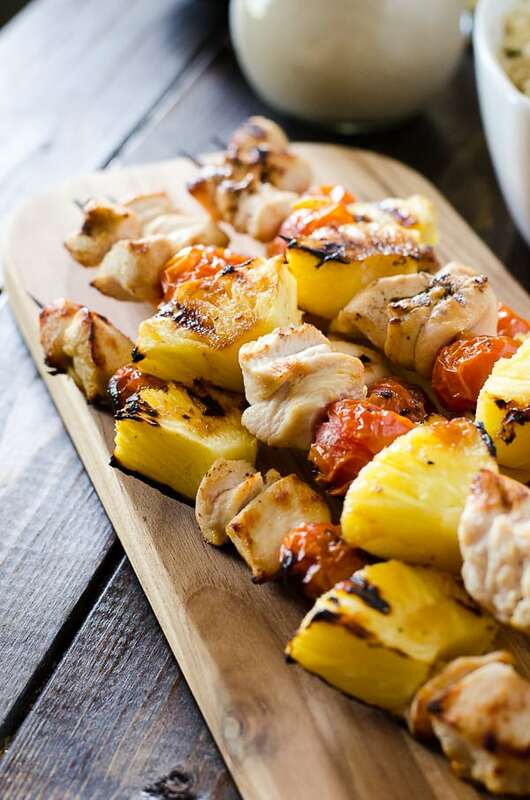 Arrange chicken, pineapple, and tomatoes on skewers in alternating patterns, setting each one on the lined baking sheet when done. Place skewers on grill and cook until chicken is cooked through, 10-15 minutes, turning 2-3 times during cook time. While skewers are cooking, place the marinade in a small saucepan with water, coconut, and cornstarch. Bring to a low boil over medium-low heat and allow to simmer for 10-15 minutes until thickened (this is ensure it’s safe to eat and to meld flavors.) Transfer to a sauce bowl. Serve skewers with sauce and a side of tropical-flavored rice. Enjoy! Are you a freak for coconut like I am? Even if there’s no pineapple involved, all of these recipes by my fellow Sunday Supper Tastemakers are incredible!! Oh Erica! These skewers look delish 🙂 I had my pina coladas on our cruise on a daily basis. lol Your so adorable in that pic! Perfect for a summer night grilled meal! I need to kick back and relax and this is just the way to do so! These look and sound so delicious – love the flavors of course, but also they look so pretty. Oh, boy, these skewers look fabulous (especially since they don’t actually taste like pina coladas, LOL!). Love your coconut drink. It’s not a cruise without one, is it? 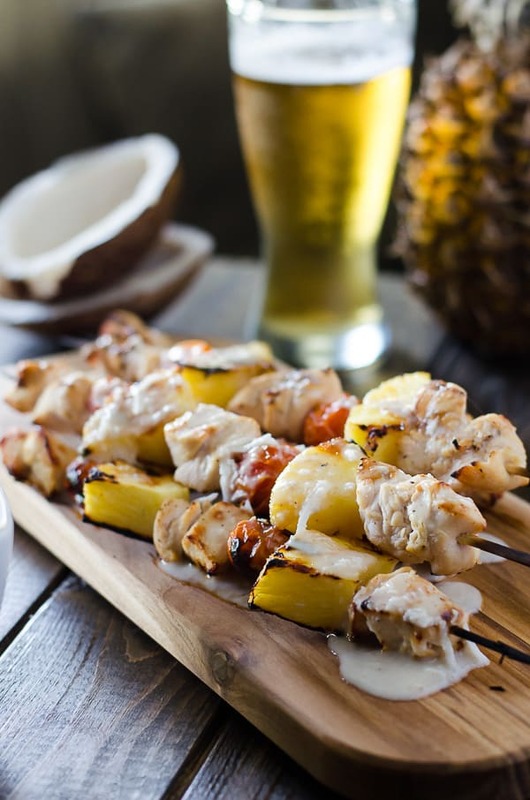 I must try these skewers…anything with coconut and pineapple and I’m there! These look sooooooo good and your pictures are beautiful! I love this savory twist on the pina colada flavors! I love that you made a savory dish instead of a dessert. And these look phenomenal. Can’t wait to try them.